Size : 14.7 x 15.2 ;mm. Weight : 3.03 grams. Reverse : Uncertain punch mark (the same one visible on the reverse of MA-4195), partially covered by encrustations. 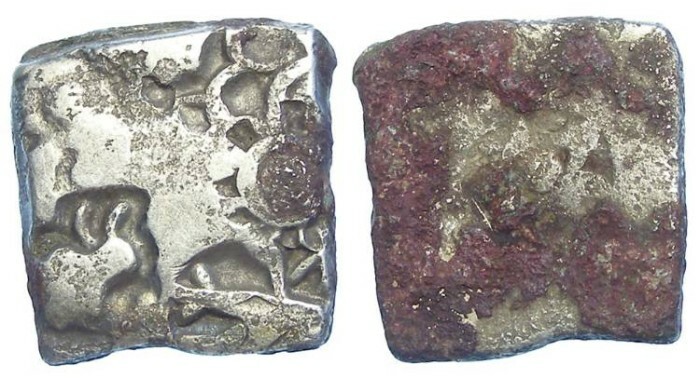 Mitchiner, in his series ORIENTAL COINS AND THEIR VALUES, attributes this particular set of marks as #4195 or 4196 and dates it to the time of Samprati from 216 to 207 BC). Most experts in this field do not accept his attributions and feel that currently we simply do not know which kings issued which sets of punches, so can only date them to the general Mauryan period.